Could Michelle Nicolini Soon Find Herself In World Title Contention? Michelle Nicolini’s expertise as a Brazilian jiu-jitsu exponent is not in any doubt. And yet there is always doubt when even an eight-time BJJ world champion of her caliber enters the ONE Championship cage. Although there were questions about whether the Brazilian’s striking would be up to scratch, any fears were likely removed by her destruction of Irina Mazepa. The Russian is arguably ONE’s most fearsome female striker, having blown Ann Osman away with a crushing left hook back in 2015. Now, at ONE: VISIONS OF VICTORY from Kuala Lumpur’s Axiata Arena, Nicolini faces Iryna “Delsa” Kyselova, a woman far more experienced than Mazepa, and a veteran competitor with an 11-2 record. The Ukrainian has her fair share of submission victories, eight from her 11 wins, but also has one submission loss. 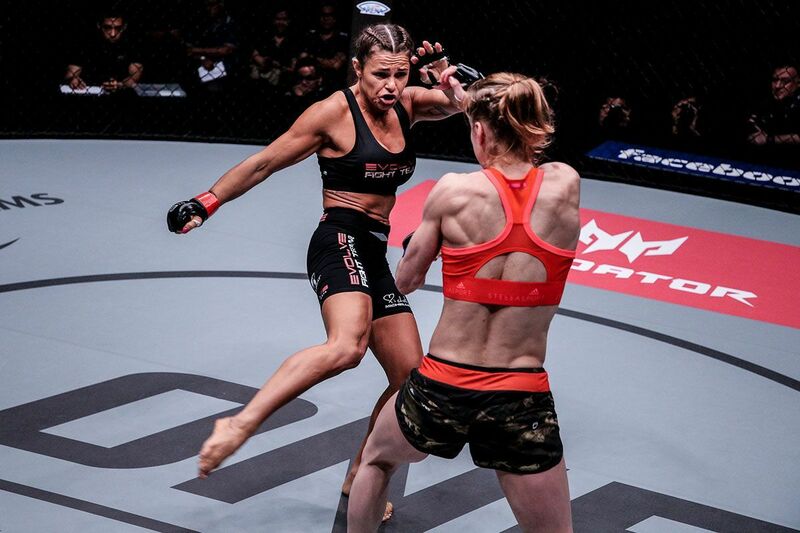 Nicolini’s 4-1 record is underpinned exclusively by submission victories. Kyselova’s pair of KO wins are then the only knockout finishes on either woman’s professional record. This is a pivotal match-up in the women’s strawweight division, which is now being ruled by divisional queen “The Panda” Xiong Jing Nan. The Chinese phenom delivered an outstanding performance in January, when she defeated then-unbeaten Singaporean Tiffany Teo to claim the inaugural ONE Women’s Strawweight World Championship. If Nicolini can extend her ONE record to 3-0 against Kyselova, especially with a win inside the distance, she would, in theory, set up the possibility of an enthralling contest with Xiong for the world title. A win for Kyselova would open more doors in that regard. She could most certainly find herself in the title picture, although a second contest in the ONE cage might be preferable for her. In either case, a match against Singapore’s May Ooi could be in the future for whomever is victorious in Kuala Lumpur. Kyselova is tall, and that might pose problems if she can utilize a stiff jab. But she is not the tidiest of strikers, and Nicolini should not have too much trouble getting through her defense to force a quick takedown, which would open the door for a submission, likely in the first round. Steve Dawson is a ONE Championship presenter and commentator, a Fox Sports presenter and an author of sporting biographies. He can be found at www.coachsd.com. Kyselova’s striking appears to be similar to Xiong’s, a bit on the wild side and present an excellent opportunity for Michelle to take either of them down. With her victor over Kyselova, Michelle has definitely earned a title shot against Xiong. I hazard to guess that it will be Michelle that Angela will have to face if she wishes to take the title in 2 divisions.